New changes are coming to environmental management systems! The upcoming revision to ISO 14001 in September 2015 focuses on helping organizations develop sustainable business practices that will revitalize, restructure and improve their environmental management practices while driving business and sustainability performance to a higher level. The revised standard offers organizations the framework to prepare for future environmental challenges and business opportunities. To receive your free copy our article, please visit our website and fill out the form. The importance of sustainability as a business issue has steadily grown over the past two decades. Many companies are beginning to see the value in sustainability reporting. Reporting data provides businesses with an increased awareness of greenhouse gas emissions hotspots, creates opportunities to innovate and generate revenue from sustainable products and services, and serves to future-proof businesses from climate change and water impacts. Once all of the data is collected, investors use the information to analyze how climate change is likely to affect business. The Global Reporting Initiative (GRI), a non-profit organization striving to make sustainability reporting standard practice, and CDP, a non-profit organization providing the only global environmental reporting system, recently released a joint publication outlining how GRI’s G4 guidelines and CDP’s 2015 Climate Change Questionnaire align. The document provides useful cross-references between the two reporting structures to make corporate reporting more efficient and establish best practice. For the full publication, “Linking GRI and CDP”, visit here. Recent droughts and pollutant spills across the nation have prompted policymakers to discuss the issue of water security. More specifically, the discussions center around the Clean Water Act and focus on clarifying aspects of the proposed Waters of the U.S. rule from the EPA. 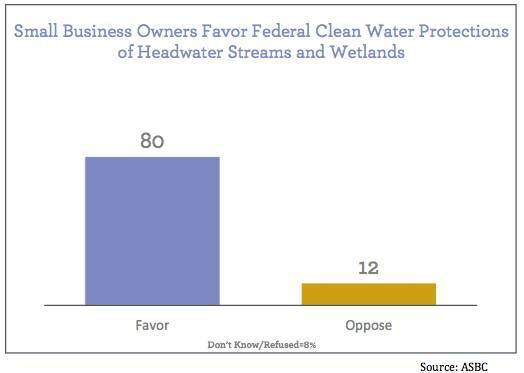 According to a recent national poll conducted by the American Sustainable Business Council (ASBC), 80% of small business owners favor federal protection of upstream headwaters and wetlands as proposed in the new Waters of the U.S. rule. Additionally, 71% of small business owners agreed that clean water is necessary for jobs and a healthy economy. More than two-thirds of those surveyed believe that government regulation is needed to prevent water pollution. More and more businesses are seeking to increase their clean-energy purchases. However, these companies still find it immensely difficult to source clean power for their existing energy needs. Many blue-chip companies, such as Walmart and Sprint, are attempting to go Beyond Certification™ in renewable energy to articulating new terms regarding power purchasing agreements. A dozen of these companies have initially advocated for the Renewable Energy Buyers’ Principles, published by the World Resources Institute. The principles outline the challenges and needs of large renewable energy buyers. Supporters hope the literature convinces utilities and government regulators to consider new procurement models that will help them in meeting corporate clean energy targets. In addition to serving new projects, the principles also focus on shifting existing relationships. The buyer’s group and their proposals will likely gain more attention as they endeavor to reach utility executives and government officials across the nation. To learn more about the Renewable Energy Buyers’ Principles, visit here. Over the past few years, Americans have been taking advantage of financial incentives and making use of renewable energies. However, since many incentives are set to expire over the next few years, newer concepts like net energy metering are becoming increasingly popular. Net metering refers to a billing arrangement whereby homeowners and businesses with alternative energy sources can sell back the power they did not utilize to electricity companies. In turn, customers receive a credit at full retail rate to use against the power that they do consume from the grid. Net metering helps utility companies meet Renewable Portfolio Standards, which obligates them to produce a specified fraction of energy from renewable sources. Due to its user-friendly nature, net metering has the potential to grow and proliferate among businesses already utilizing solar power. For companies who have not yet explored the option, various solar companies, like SolarCity and Trinity Solar, are promoting solar installation deals that require no upfront fees. As alternative energy continues to expand and flourish, more and more businesses are seeing the benefits of renewable sources. Utilizing renewable energy seems to be beneficial for businesses worldwide and the trend is saving companies hundreds of millions of dollars per year. Altogether, a sampling of companies within the The Fortune 100 achieved annual savings of approximately 1.1 billion dollars in total. Among those listed, UPS saved $200 million, Cisco Systems saved $151 million, and PepsiCo $120 million. Most of the companies on the list achieved high returns on their investments by meeting or exceeding their renewable energy targets. Additionally, more than half have also set additional emissions reduction targets beyond what is required. To meet renewable energy targets, Fortune 100 companies primarily use three tools for procurement: tradable Renewable Energy Certificates (RECs), Power Purchase Agreements (PPAs), and on- or off-site direct investment. Businesses continue to purchase and utilize renewable energy to reduce costs, diversify their energy supply, and to achieve GHG emissions reduction targets. These companies see investing in renewable energy as a viable business opportunity and demonstrate the value of clean energy, while setting precedents for others to follow. To view the full Ceres report, visit here. For the first time in its history, the FIFA World Cup has integrated renewable energy. The largest soccer stadium in Brazil, Mineirão, is the first of its kind to be solar-powered. The 6,000 photovoltaic panels produce about 1,600 megawatts-hour per year (1.4 MW). Since it is not possible to store all of the energy, 10% of it will be used to power the stadium, while the rest will be transferred to consumers. While Brazil may be putting its resources into good use, other countries around the world do not have the luxury. One-third of the competing countries in the Cup have less solar-energy than a single stadium in Brazil; Bosnia-Herzegovina, Croatia, Cameroon, Colombia, Costa Rica, and Ecuador are just a few examples. Many of these countries rely on fuels like petroleum and coal. In Ghana, for example, 84% of the country’s 23.5 million people rely on fossil fuels for their energy needs. Although Brazil’s efforts in energy alternatives is a step in the right direction, they only reduce a fraction of the 2.72 million tons of carbon dioxide emissions this World Cup is expected to produce.